In 1968, Japanese author Yasunari Kawabata became the first Japanese author to win the Nobel Prize for literature. The author of numerous works published between 1925 and his death by suicide in 1972, amongst his most widely used in the classroom is the short story "Izu Dancer." Originally published in 1925, this story helped first establish his reputation in Japan. On the surface the story of the relationship between an 19 year old college student and a young dancer, the work can be used to approach numerous issues, such as the dislocation and isolation of the newly urban in the 1920s or the artistic/literary rendition of the temporary nature of beauty and individual moments. 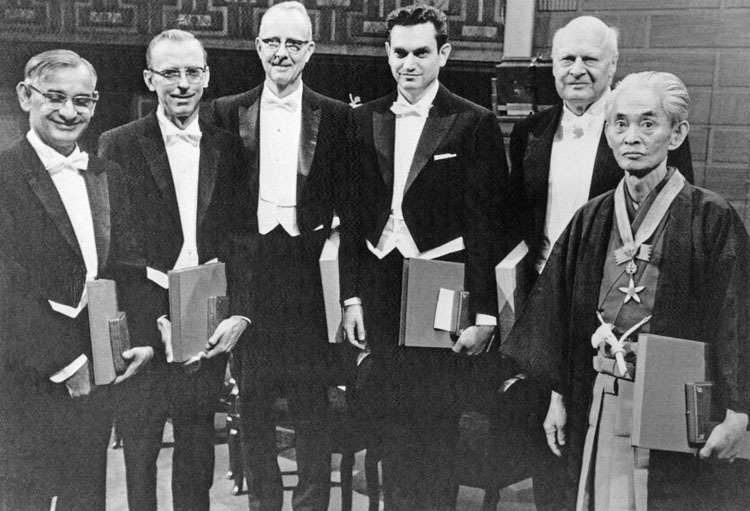 On a larger scale, awarding Kawabata the nobel prize signifiied an acceptance of 20th century Japanese literature and culture on an international scale. The picture here, taken in Stockholm in 1968, features the winners of the 1968 nobel prizes.